What a stunning family home set over three floors! This lovely four bedroom semi-detached residence is a true credit to its current owners having a tasteful mix of modern and traditional features carefully blended together. Just wait until you see the top floor and of course, the view! Situated near to the great range of local amenities in New Brighton including The Light cinema, Morrison’s supermarket, post office and the promenade. Well placed for excellent local schooling, public transport routes and commuter links. Interior: porch, hallway, WC, living room, dining room and a tastefully chosen kitchen on the ground floor. Off the first floor landing level there are three bedrooms and a re-fitted family bathroom. Up the second set of stairs, boasting an excellent view out of the window, to the second floor level where there is a living area and fourth bedroom with dressing room and modern en-suite. Exterior: well-kept rear garden and driveway to the front. An absolute must see! DOWNSTAIRS WC A handy cloaks room; ideal for a family home of this size. Low level WC and floating wash basin. Wall mounted Vaillant boiler. Central heating radiator, ‘easy clean’ panelled walls and solid oak flooring from hallway. DINING ROOM 14′ 02″ x 13′ 03″ (4.32m x 4.04m) uPVC double glazed window to front elevation. Picture rail, beautiful coved ceiling and central heating radiator. Brick fireplace housing a working fire. Oak laminate flooring. 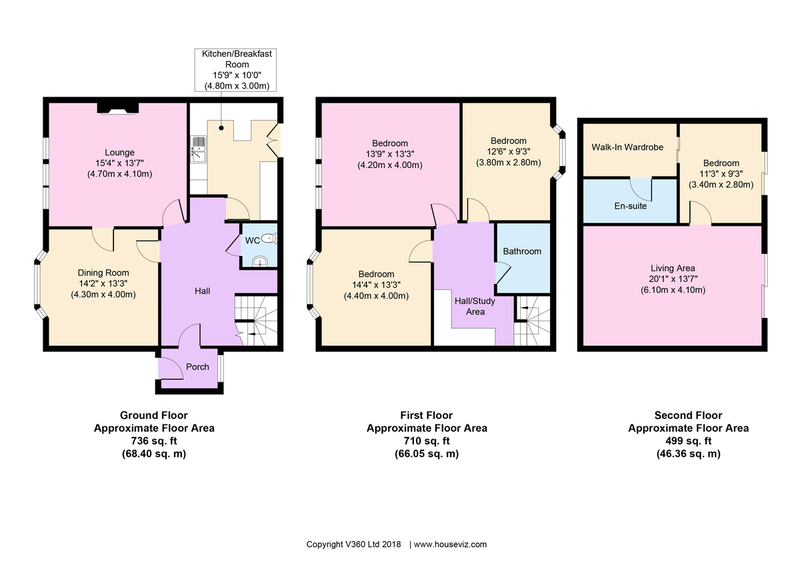 KITCHEN 15′ 09″ x 10′ 0″ (4.8m x 3.05m) Well planned and tastefully chosen kitchen. Matching range of base, wall and tall units with solid granite work surfaces over and roll backs. Inset Smeg sink and drainer with flexi rinse tap above. From a peninsula style unit is an inset Baumatic ceramic hob with overhead extractor. The oven, grill and microwave are set into a tall unit. Integrated dishwasher, fridge, freezer and hidden space in units for washer and dryer. Double opening uPVC double glazed patio doors out to rear garden. Two pull up power units with USB charging points. Central heating radiator, inset ceiling spotlights and tastefully chosen part tiled walls, finished off with slate tile effect flooring. BEDROOM ONE 13′ 03″ x 13′ 09″ (4.04m x 4.19m) uPVC double glazed bay window to front elevation. Picture rail, coved ceiling and television point. Central heating radiator and fitted wardrobes. BEDROOM TWO 14′ 04″ x 13′ 03″ (4.37m x 4.04m) uPVC double glazed windows to front elevation. Picture rail, coved ceiling and central heating radiator. Television and telephone points. BEDROOM THREE 12′ 06″ x 9′ 03″ (3.81m x 2.82m) uPVC double glazed bay window to rear elevation with views of the water. Picture rail, coved ceiling and central heating radiator. Fitted bedroom storage and oak laminate flooring. FAMILY BATHROOM Re-fitted family bathroom with uPVC double glazed frosted window. Suite comprising panel bath having a rinse attachment, corner shower cubicle, low level WC and pedestal wash basin with mirrored vanity unit above. Inset ceiling spotlights, extractor fan and central heating radiator. ‘Easy clean’ part panelled walls and tile effect flooring. SECOND FLOOR From the main landing is a turned staircase with uPVC double glazed window on turn that leads up to the open plan second floor landing area; just wait until you see the view. EN-SUITE A modern fitted en-suite shower room with double glazed Velux window bringing in added light. Suite comprising oversized step in shower cubicle, low level WC and a large floating unit with wash basin. Extractor fan, inset ceiling spotlights and wall mounted storage unit. Ladder style radiator, part tiled walls and tiled flooring. FRONT EXTERIOR An inviting approach at the front of this delightful home with a welcome home light by the front door. The front is paved with Indian sandstone creating an excellent re-paved driveway with pebblestone borders and a wall mounted electric car charging point. Wrought iron side access gate that continues to the rear garden. REAR EXTERIOR Well-kept and planned rear garden; ideal for relaxing in over those summer months. Starting with the raised decked patio accessed from the kitchen patio doors. This continues to a lawned area along with a re-paved patio in Indian sandstone. External power and lighting. Side access gate. LOCATION St George’s Mount can be found off Rowson Street, approx. 1.3 miles driving distance from our Liscard office.